A commercial mortgage-backed security or CMBS is a type of fixed-income security collateralized by commercial real estate loans. These loans are typically for commercial properties, such as office buildings, hotels, malls, apartment buildings and factories. They're not the same as the subprime residential MBS products that contributed to the collapse of credit in late 2007. CMBS made up about 2 percent of the total U.S. fixed income market as of 2016. A CMBS is created when a bank takes a group of loans on its books, bundles them together, then sells them in securitized form as a series of bonds. Each series will typically be organized in "tranches"—think "segments"—from the highest-rated, lowest-risk CMBS or "senior issue" to the highest-risk, lowest-rated CMBS. The senior issue is first in line to receive principal and interest payments, while the most junior issues will be the first to take a loss if a borrower defaults. Investors choose which issue they invest in based on their desired yield and capacity for risk. Loan securitization is useful in a lot of ways. It enables banks to make more loans, it provides institutional investors with a higher-yielding alternative to government bonds, and it makes it easier for commercial borrowers to gain access to funds. CMBS offer investors an alternative to real estate investment trusts or REITs as a convenient way to invest in the U.S. real estate market. There are significant differences between the two investments. REITs are equities whereas CMBS are debt securities. An advantage of a CMBS or REIT is that CMBS offer a guaranteed return rate while REITs do not. CMBS written after the 2008 financial crisis tend to be larger and characterized by more stringent underwriting standards. Another possible advantage of CMBS in the bond market is that they generally offer higher returns than either corporate or government bonds. The loans that back CMBS are typically fixed term. They can’t be repaid early by the borrower without a penalty. As a result, CMBS typically offer substantially lower prepayment risk than residential mortgage-backed securities—securities that are backed by mortgages on single-family homes. Prepayment risk is the possibility that falling interest rates will cause borrowers to refinance and pay back their old mortgages sooner than expected as a result. This would cause the investor to receive a lower yield than anticipated. As is the case with corporate bonds, commercial mortgage-backed securities are at risk of default. If the underlying borrowers fail to make their principal and interest payments, CMBS investors can experience a loss. 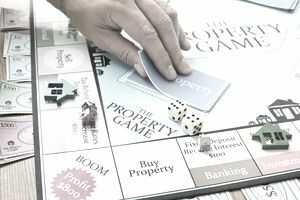 The risk of individual issues can vary based on the strength of the property market in the specific area where the loan was originated, as well as by the date of issuance. For example, commercial mortgage-backed securities issued during a market peak or at a time when underwriting standards were low are likely to pose higher risks. CMBS can also be negatively affected by weakness in the real estate market, as was the case in 2008 and 2009. CMBS lending dried up in the wake of the financial crisis of 2008, but it gradually came back as market conditions improved. CMBS offer investors a legitimate way of investing in U.S. real estate, but if they are inaccurately rated or dishonestly represented, they can present the same uncompensated risks to buyers as the fateful sub-prime MBS that threatened the U.S. economy in the Great Recession of 2008. Although you could conceivably invest in a commercial mortgage-backed security, these are typically only owned by wealthy investors, investment entities or the managers of Exchange Traded Funds or ETFs. Several ETFs specializing in MBS and at least one—the iShares Barclays CMBS Bond Fund (ticker: CMBS)—invest only in commercial mortgage-backed securities. For retail investors, these ETFs may be the best way to invest in these debt securities because they present a reasonably diversified risk without a large investment. View the fund’s performance as well as the general historical performance of MBS before considering a specific MBS investment, and specifically a CMBS investment. Make sure you're comfortable with the potential risks. Disclaimer: The information on this site is provided for discussion purposes only and should not be construed as investment advice. Under no circumstances does this information represent a recommendation to buy or sell securities.